What you need to know about Hand and Finger Tattoos. Hands and fingers are currently a very popular position for tattoos, from the amusing ‘shhhh’ and moustaches to smaller more intricate designs. 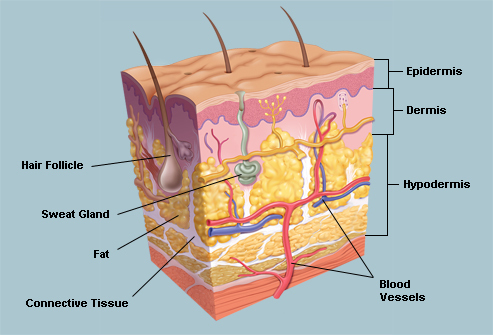 The hypodermis, which is made up of fat and connective tissue. The skin on our palms and soles does not have hair and is thicker which enables our bodies to perform tasks such as walking and picking things up, the skin on the top of our hands, feet and face is noticeably thinner. Looking at hands you will see that the skin changes about half way around our fingers, this thicker skin regenerates much faster than anywhere else on your body. Tattoo ink sits inert between the Epidermis and the Dermis skin layer, but with the varying thickness of the Hypodermis tattooing over ‘bonier’ areas makes it more difficult for your tattooist to evenly place the tattoo ink in the correct position; often resulting in the ink being put in too lightly or too deep. Tattooing too lightly will mean that your tattoo will fade quickly and some lines may even ‘drop out’ during the healing process, so will require regular touch up’s which will have an on going cost implication to maintain the look of your tattoo. Whilst placing the ink too deep can cause what is known as ‘blowout’, which is when the ink overloads the capillaries and disperses spreading out under the skin leaving a smoky/fuzzy shadow around your tattoo. Positioning the tattoo onto the top of the hand or foot can have similar issues but care should be taken in avoiding the design being positioned on the sides (the fade-line) as your tattoo can literally fade within weeks. Again leaving you with the financial burden of regular visits to your tattooist or in having half a tattoo. The risk of infection during the healing process is obviously going to be much greater with a tattoo on your hand, so additional care is required. Infection can cause scarring along with loss of ink. Your tattooist should discuss all these points with you prior to you making your final decision on placement. But will also reserve the right to not tattoo you. Society can still be judgemental regarding visible tattoos, and you have to consider the long-term implications from having a hand tattoo. There are still some professions who will not employ anyone with visible tattoos. Tattoo Laser Removal is not always as successful with hand tattoos. There a lots of images of tattoo’s available on line; but these can also often not be pictures of fully healed tattoos. A question that we are often asked what a Dermal Skin Diver is and what the difference is between a Skin Diver a Dermal Anchor and a Surface Piercing. A Skin Diver is a gem on a stem with a small arrow shaped base. The base has no holes so it can be easily removed or knocked out. The gem on the top of a skin diver cannot be changed. A Dermal Anchor again is a gem on a stem but its base is bigger, more like a foot. The base has holes in it to allow the tissue to entwine through the base anchoring it into your body. An Anchor should be considered a permanent piercing and will probably need to be surgically removed when you decide to retire your piercing. There is also a Skin Diver Wheel, which is a cross between the Anchor and the Diver as the base whilst smaller than the Anchor has holes in the base to enable tissue to secure the jewellery; this should also be considered a permanent piercing also requiring possible surgical removal. The gems can be changed on both the Anchor and Wheel. Surface Piercings are very much as they sound and are when a piercing sits long ways under the surface of the skin. Surface piercings can be difficult to heal and are more likely to be rejected (grow out). Surface Piercing’s can also leave scarring, and not just around the entrance/exit but along the length of the bar. A Dermal piercing is a single point piercing, which can be placed virtually anywhere on the body. With popular placements for Dermal Piercings being on the hips, wrists, neck and chest (cleavage). Because of how the piercing is performed they can be placed very close together and can be used to create patterns or to enhance a tattoo. Whilst we said earlier that the Anchor and Wheel should be seen as permanent, your body can reject piercing’s for a number of reasons, and knocks to the area can be the cause of the rejection of your implant. With care, especially in the early day’s, they do have the potential to last a long time. Positioning of a Skin Diver should be considered, whilst placement on the hand or hips is popular both positions are likely to be knocked which can cause them to either migrate or to be actually knocked out. It is recommended that for the first two weeks of having a Skin Diver fitted that you treat the site with great care. Skin Diver’s can also be used to enhance your tattoos, but care needs to be taken, as when you either retire or knock your piercing there is a possibility that you will also remove a small section of your ink, which may need to be repaired by your tattooist once the piercing site, has healed. A Dermal Punch/Biopsy Punch is used to fit a Skin Diver or Anchor, where a plug of tissue is removed. The jewellery is then carefully fitted. Bleeding should be minimal, but this can be dependant on positioning and the individual. A Dermal Piercing is likely to heal quicker than a surface Piercing, as that is not as much trauma to the skin and tissue. When you decide to retire your Skin Diver you can usually do this by massaging the area, like wobbling a tooth out. By not rushing this process you are likely to reduce any risk of scarring; massaging the area will also help to reduce the any scarring. Scarring for a Skin Diver should be no bigger than a chicken pox scar, or leave a slight discolouration to the skin.